Diverticulitis. 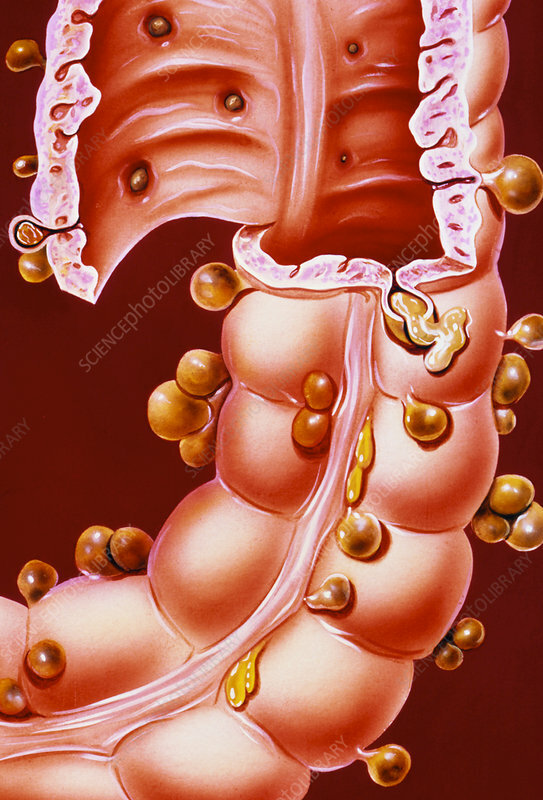 Illustration of a region of the descending colon of the human intestine, showing diverticulitis. Also known as colonic diverticular disease (CDD). Small growths appear on the outer colon wall (seen coloured brown). They may develop at weak points along the length of the gut, their frequency increasing with age. The remains of digested food may collect in these inflamed growths, and the condition is also associated with abscess formation. Diverticulitis may cause fever, vomiting, abdominal pain, and rigidity of the abdomen over the area of intestine involved. Treatment may involve a liquid diet, the use of antibiotic drugs, or surgery if bleeding occurs.